Written by Catherine Saxelby on Wednesday, 08 February 2017. Australia’s Healthy Weight Week (AHWW) is back for 2017 and the theme is more healthy home cooking. That includes vegetables and salads! AHWW is an initiative of the Dietitians Association of Australia or DAA. Now in its tenth year, it aims to raise awareness of the importance of achieving and maintaining a healthy weight and lifestyle. Sounds great to me. Get the weight loss edge! I bet it comes as no surprise that, when you’re after weight loss, researchers have found that eating more non-starchy vegetables (like cucumber, mushrooms, or salad leaves) gives you an edge. Using vegetables for losing weight is a smart idea – they are low in kilojoules/calories, contain vitamins and minerals, and fill you up with their fibre and water. They have what nutritionists call a low kilojoule density. In other words, there’s a lot to eat on your plate but they have fewer kilojoules in each bite. In the old days, diet sheets would call them “free vegetables” as you could eat as much of them as you wanted. They were, and still are, incredibly low in everything you don’t want and powerhouses of things you do, like antioxidants, fibre, vitamins and minerals. Use vegetables for weight loss – they’re low in kJ/Cal, and contain vitamins, minerals, and fibre. You chew lots which is also good for weight loss which I suspect is a big factor in the success of the raw food diet, often touted for losing weight. They can substitute for starchy root veges like potato or starchy grains like rice or cous-cous so you eat less. And you can add them to any grains you cook to create a half-grain, half-vege dish such as a green fried rice. These veges like capsicum, mushroom, celery, artichoke hearts ‘dilute’ down the final carbs you eat yet leave you feeling good. Which means if you replace other sources of food with these, you'll lose a lot of weight! By replacing high-density foods with low-density ones, you can stay full for longer and resist the temptation of having a food fest at each meal! Forget that myth about these low-carb or free veges being ‘negative calories’ meaning that they burn off more kilojoules or calories than they provide. They have so few kilojoules – like 15kJ or 5 cals from a stick of celery – that it doesn’t matter. Having vegetables ready in your fridge can help you make healthier choices if you need a snack or need to make it another hour or two to the next meal. Plus a container of peeled carrots or celery sticks or cucumber lengths is quick to grab and munch on. For dieters, they’re a dream food. Plus there's new research saying that people who eat large serves of vegetables and fruit experienced "increased happiness, life satisfaction, and well-being." Wow. Now that's good news! Carrots are top of my list among vegetables for losing weight. I just love the crunch and convenience of carrots. I love them cooked, uncooked and grated in salads. What I like most is that carrots taste great eaten raw whilst they’re economical and keep well in the fridge. They are wildly healthy. Just think of all that beta-carotene and fibre! And they make a healthy stick to dip into hummus or tzatziki. 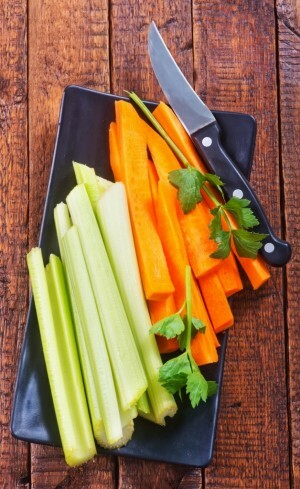 Dip into just enough to flavour – you don’t need to drown a whole carrot stick. And they don’t get stuck in your teeth. Mushrooms are tasty and versatile and you can put them in almost anything! Throw them in the frypan with chicken or fish and a sprinkle of mixed herbs, or add them to an omelette with tomato and chives. And nothing jazzes up a BBQ faster than a serve of mushrooms and caramelised onions on that chop. Since they have little flavour of their own, they meld into whatever you're cooking! The best example I know is to substitute half mince with half chopped mushrooms (an equal weight) and shape them into burgers or meatballs. Or into a Bolognaise meat sauce. No-one will notice this as the flavour gets an umami boost and they add texture to the meat without adding many kilojoules. The Mushroom Growers call this ‘blendability’ and their website gives you heaps of ideas on how to incorporate them. Cucumber has a lot of water and flesh, and no fat or carbs. It now comes in many different lengths and shapes. There’s one for any occasion. I use the small ‘cukes’ sliced lengthwise and into quarters for dips and munch sticks but like the longer ones for salads, and apple cucumbers on sandwiches. Ditto for raw fennel and radishes. Like cucumber, celery is pretty much all water and supplies hardly any kilojoules, so it´s great for weight loss. You also get fibre as well. It’s another vegetable that´s great to eat raw with all that crunch and crispness. Cauliflower is set to become THE veg of 2017. And it’s easy to see why. It's a low-density food, with no fat, plenty of fibre and a great taste. It’s a brilliant vegetable when you´re trying to lose weight, as it’s so versatile. It can replace a mound of potato mash or a bowl of rice and so slash the carbs and kilojoules. You can use cauliflower in everything from pizza bases to cauliflower steaks that you pan-fry. Half a cauli goes a long way so when it’s in season, why don’t you buy up big? If you’ve always disliked it, try cooking it lightly – just enough to take away its toughness and make it tender to bite. Don’t overcook it. Fresh or dried, chilli adds a lot of zing to your meals which makes a diet dinner suddenly come alive. Research says it can boost your metabolism too so your body burns more for a couple of hours afterwards. How much to eat? There’s little guidance in the research but I’d guess enough to warm your mouth nicely for 20 minutes after eating. It won’t hurt and does a lot of good. If you can’t stand chilli, you can do the same with black pepper, horseradish, hot mustard or wasabi – go gently until you’re used to these oral irritants. OK. I admit it. I am into a big salad each and every day so this one is not hard for me. My fave side is a tossed green salad with lots of different leaves. Some I’ve been trying to grow fresh in my garden (not always with great success) and some I buy when out shopping. I can whip up a bowl quickly and I always have a drizzle of dressing over it. It rounds out any meal from steak to pizza and means you can still counter the side effects of ‘too much’. A green salad contains no fat at all and plenty of phyto-nutrients. Get used to the taste of these lovely vegetables. They will reduce your total intake and add to your intake of vitamins and healthy things. Grab your apron and start experimenting so that you can find an amazing veggie creation that you love! Join my #5aDayChallenge on Instagram where I feature these 7 with ideas on how to serve them. Thanks to Calorie King for the kilojoule and Calorie counts.